Engineers are urging the government to build a high speed north-south rail link, which would see journeys from London to Scotland take just three hours. A new report by the Institution of Civil Engineers (ICE), called ‘The Missing Link,’ says a dedicated rail route will boost the national economy and be more environmentally friendly than motorway or airport runway expansion. 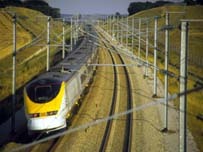 The line would also connect regional cities to the economically prosperous south east, and the Channel Tunnel Rail Link, due to open in 2007. Eurostar bosses have already backed the report. According to the ICE report the new link, which would be six times the length of the CTRL, could be built over a ten year period at a cost of £3bn a year. This they say would be less than 0.5% of government spending in 2005. The costs, which are based on current CTRL spending, would be met by the private as well as public sector.